I’m psyched. 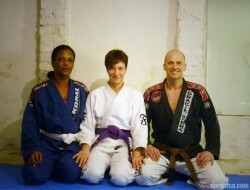 There’s a new woman on the Dartford BJJ team and she’s very tough. Kelly is a seasoned striker and is extremely strong and fit; I am very excited to have such a powerful woman on the team to balance out our Ladies Squad of shrimps! Kelly is interested in MMA and Coach has invited me to work as her sparring partner to help her improve her ground game. It is early days but this woman’s attitude is so spot on that she learns quickly; she’s open to instruction and trusts the technique she’s being shown. Her athleticism is off the charts; in addition to being a veteran striker, Kelly is a personal trainer and has many years experience in the health and fitness industry. So, we had our first session, today. After a warm-up looking at clock choke variants and fundamentals of mount escape we hit the sparring, rotating partners after each sub. Was tremendous fun and I am so happy to be Kelly’s sparring partner. I’ve said it before and I’ll say it again: BJJ is all about cooperation. Though the three of us run the gamut of size and experience, we were all able to work our stuff and – I hope – leave the mats with a sense of positivity and achievement. To commemorate our inaugural session we recorded a few rounds of sparring. Here’s me getting my a$$ handed back. Keep your eyes peeled for the ‘surfjitsu’ at 0:56. During 2008, I competed as a white belt at the Gracie Invitational at SENI and at the Kent BJJ Open (now the English BJJ Open). Here’s a video of my first fight at the Kent Open with Seetha Udin of Checkmat. I went on to win my second bout on points and to lose my third on points to take home the silver. The Gracie Invitational at the SENI exposition in May 2008 was my first BJJ competition; I also competed at the Kent BJJ Open in that year, shortly before a second knee injury took me out of that part of the game. I won my first fight by arm bar and below is a video of my second bout against Zoe Hull of Pedro Bessa BJJ; I took home the gold that day. This was an exhilarating experience which taught me a lot about myself and what I can be capable of under pressure.